Here’s how to use privacy fences to keep the bugs away. Although you might not always get along with your neighbors, you don’t always want to keep them off your property. Still, you’d probably prefer it if mosquitoes and other pests didn’t get into your yard. Here’s how to use privacy fences to keep the bugs away. 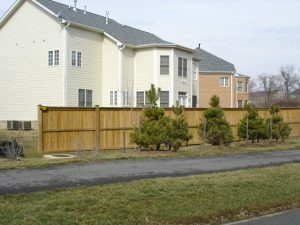 First things first, you should put up a privacy fence in your yard. You would think that since most bugs are so small they can just crawl in through the gaps or cracks in your fence. While that is true, installing a privacy fence can keep out bigger animals, such as deer and squirrels, from wandering into your yard and leaving behind fleas or other pests. Even in the summertime, it will rain a lot. There will be days where you won’t see the sun at all. One huge advantage of sunny days is that they’ll evaporate any puddles of standing water left behind by all the rain. Standing water draws plenty of insects because they’ll find it a convenient place to gather and multiply. So how do you prevent standing water from collecting on your property? There’s a process known as rolling. During the fence installation process, you stop and take the time to make your yard as flat as possible. Then pay extra attention to the areas around your privacy fence – by adding more dirt or soil, you can keep water from pooling there. You’ll also need to do some periodic landscaping work throughout the summer. Mowing your lawn keeps the grass from growing too tall, which means the bugs have lost another hideout in your yard. Be sure to use some weed killer to help slow down the growth of weeds, which are not only annoying but could be a food source for bugs invading your yard. This entry was posted on Friday, July 27th, 2018 at 5:03 pm. Both comments and pings are currently closed.